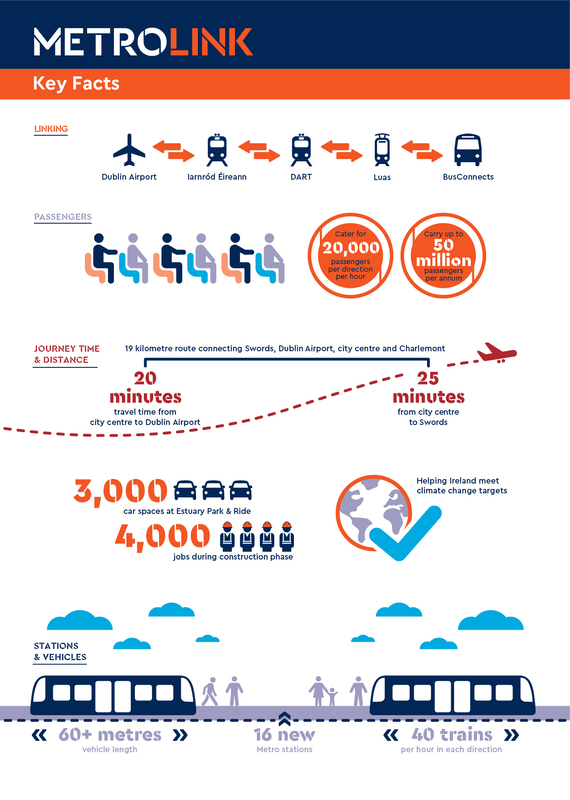 MetroLink is a proposed high-capacity, high-frequency rail line running from Swords to Charlemont, linking Dublin Airport, Iarnród Éireann, DART, Dublin Bus and Luas services. It will be serving crucial destinations including Swords, Dublin Airport, Ballymun, the Mater Hospital, the Rotunda, Dublin City University and Trinity College. MetroLink will provide faster reliable journey times, with much of the 19 kilometre route running underground. After reviewing the feedback about the Emerging Preferred Route, the Preferred Route was developed. To provide feedback on the Preferred Route, please submit your contribution through the MetroLink website between Tuesday 26th March 2019 at 2.00pm and Tuesday 21st May 2019, 5.30pm. Hilton Hotel, Charlemont Place, D02 A893, Monday 8 April 2pm-8pm. The Gresham Dublin Hotel, O’Connell Street, D01 C3W7, Wednesday 10 April 2pm-8pm. Glasnevin Cemetery Museum, Finglas Road, Glasnevin, D11 H2TH, Thursday 11 April 2pm-8pm. Ballymun Civic Centre, Main Street, Ballymun, D09 C8P5, Monday 15 April 2pm-8pm. Fingal County Council, County Hall, Main Street, Swords, K67 X8Y2, Tuesday 16 April 2pm-8pm. For more information, please visit www.metrolink.ie.